Every year we add another roofing story to the reputation we're building. Often an award goes with it. But the thank you letters from our customers are the best reward. Since we began in 1948, White Rose Roofing has made staying on top of technology, quality, and schedules our primary business. Working where ever our expertise is required, we have tackled some of the biggest, toughest roofing projects. 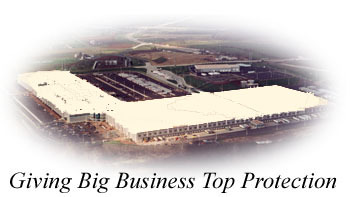 We install all of the leading single-ply membrane roofing systems for large manufacturing plants, distribution centers, and cold storage facilities. White Rose also specializes in complicated roof replacements, where in some cases the steel deck has been corroded by excessive leakage or by acids leaching from some roof insulations. We replace steel deck where it is structurally unsound, but in most cases surface corrosion can be removed with specialized equipment and painted with a two-part epoxy. When we take on your project, there are distinct advantages. First, you can count on having one of our own full-time superintendents on-site to oversee the entire roofing process. Second, we bring our own weather station, complete with current radar maps and forecasts. What we can't change, we've become expert at planning around. Third, we actively protect our client's personnel and property. Last, and most important, is our approach to management. We don't have tiers and layers and departments to struggle through when you want to talk to the person in charge. If you need to talk to our president, you've got him, and his home telephone number! White Rose Roofing isn't like most other roofing contractors--we're better, and we're more than happy to prove it. Copyright ©2000 White Rose Roofing, Inc.